We are past the halfway point of the DII football season and there is one certainty we’ve learned this season: There is no certainty in the top 25. This week, two more undefeated teams fall while the surprise of 2018 cracks the top 10. Let’s take a look at the latest AFCA Coaches Poll. There was no change at the top, as Minnesota State held on to the No. 1 spot once again. Ferris State was able to leap into the No. 2 spot after defeating former No. 2 Grand Valley State Saturday night in a 35-31 thriller. The Lakers didn’t fall too far, sticking around the top 10 at No. 8. Can we talk about what makes DII football so great for just a second? At the beginning of the year, neither Colorado School of Mines, Valdosta State, nor Tarleton State were even in the top 25. In fact, none of those schools were very close with Mines receiving 34 votes, Valdosta State 22, and the Texans nary a one. All three are undefeated and in the top 10 of DII football. You can always expect the unexpected in DII football, and that is what makes the competition great. Ohio Dominican is the only newcomer to the Week 7 poll, entering at No. 25. The Panthers opened the season inside the top 25 with two big victories over California (Pa) — which was receiving the most votes outside the top 25 entering 2018 — and Ashland, which was ranked in the top 25. They then lost to G-MAC rival Hillsdale and faded from the top 25 until resurfacing this week. It’s perfect timing. It sets up a top 25 showdown with major conference title implications on the line. Ohio Dominican hits the road for a showdown with undefeated Tiffin, looking to make the three-way logjam atop the G-MAC even more difficult to figure out. There was a three-way tie for the biggest jumps in this weeks poll. The Texans took the spotlight, jumping five spots into the top 10, landing at No. 9. Both Tiffin and LIU Post lept five spots as well, both of which remain undefeated on the season. Kutztown and UIndy both jumped four spots this week. The Greyhounds lost their opener to the Lakers and have been rolling ever since. There were quite a few drops this week as well. The reigning champs took their second loss of the season, both of which came to ranked teams. This week, Texas A&M-Commerce lost to Tarleton State, seeing them fall 11 spots to No. 18. West Florida, which has also suffered its only two losses at the hands of ranked teams, dropped nine spots. Southern Arkansas became the first top 25 team to be shutout this season but were able to remain in the poll. The Muleriders fell seven spots to No. 22. Just 13 teams remain with an unblemished record. Eight of the undefeated teams make up the top 10 of DII football. Fort Hays State dropped out of the top 25 last week after being upset in the final seconds by unranked Emporia State 28-24. The Tigers fired back this week in a commanding 50-21 victory over Pittsburg State, knocking the Gorillas from the top 25. With Northwest Missouri State still on the schedule, Fort Hays State still has time to make some postseason noise. Slippery Rock is quietly starting to put it together. Last season, The Rock had a lot of firepower, with exciting players like Milly Raye and Marcus Martin, gaining attention on the national level. With so many pieces lost, Slippery Rock entered the season a bit under-the-radar, but have now taken control of the PSAC West Divison. Roland Rivers is undefeated since taking over at quarterback and has put The Rock back on the map. Lenoir-Rhyne has grabbed the most votes outside the top 25. 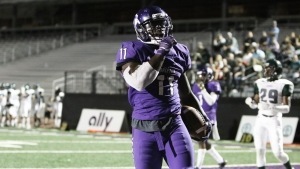 After a Week 1 loss to then-ranked West Alabama, the Bears have reeled off six in a row. Their Nov. 3 showdown with Carson-Newman will likely decide the conference and a possible spot in the postseason.